Julia lives and teaches fiddle and clawhammer banjo in Belfast, Maine. Equally at home on the stage and on the dance floor, Julia loves the percussive interplay between traditional music and dance forms and has enjoyed soaking up bits and pieces from players and dancers throughout New England and in Québec, Ireland, Brittany, and the southern Appalachians. Julia plays with Baron Collins-Hill in their duo Velocipede (www.velocipedemusic.com) and loves connecting people with music and dance. 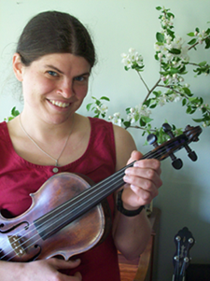 In addition to teaching at camps and in face-to-face lessons, Julia maintains freefiddlelessons.com, where she creates YouTube fiddle lesson videos and learning materials. Julia has achieved her 2010 goal to make her life more like Maine Fiddle Camp!